Each year, millions of passengers choose to buy artwork during their cruise vacations from Park West Gallery, and the vast majority of them couldn’t be happier. But a decade ago, a handful of clients became unhappy with their purchases and filed lawsuits against the company, alleging unethical business practices. Since then, the courts have dismissed all of those lawsuits, exonerating Park West completely from any wrongdoing. Park West Founder and CEO Albert Scaglione has taken these lawsuits seriously – even conducting an internal investigation to determine their merit – because they called into question not only his business but his integrity. Here he explains why these lawsuits have been dismissed, the company’s values of transparency and service and how the company is looking forward to even greater success. Why have the lawsuits against Park West been dismissed? When the Park West class-action lawsuits were filed, the courts had to review and certify the class action before it could move forward. In the case of Park West’s lawsuits, the judges presiding over these cases reviewed the facts and all came to the same conclusion: these claims did not have any merit. They were textbook examples of frivolous lawsuits. Park West and our business practices have been vindicated in each and every one. 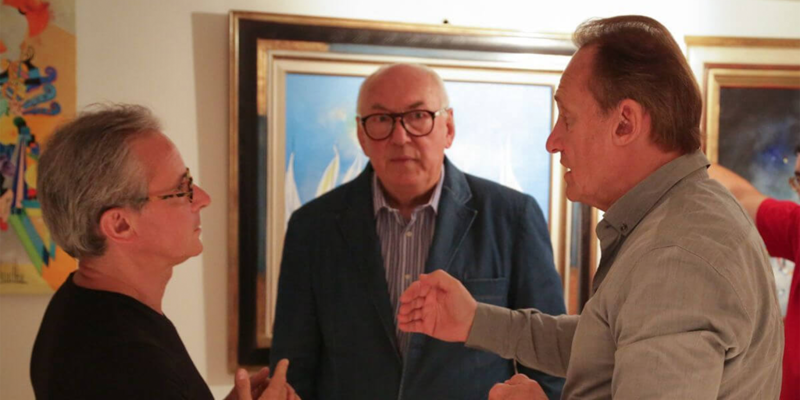 Park West Gallery founder and CEO Albert Scaglione speaks with world-renowned lithographer Stephane Guildbaud during a recent trip to Vichy as part of his mission to bring the joy of art to the lives of his clients through unique experiences. How did you react to these complaints? The news saddened me. Naturally, no one wants to be on the receiving end of a lawsuit, but I took these allegations personally. My mission in founding Park West nearly five decades ago was, and continues to be, to fill my client’s lives with joy through unique experiences with art. For anyone to feel as if they have been cheated by us in any way goes against my life’s very mission. First, I took every step possible to determine if these lawsuits had one ounce of merit. When I learned that they were all completely false, I knew I had to defend my company and my reputation against these lies. And that’s what I did. What was alleged in these lawsuits? In a world awash in moral relativism, I firmly believe in the existence of right and wrong. The lawsuits alleged that we inflated prices or sold inauthentic work, which the courts have found to be untrue. We have never—and would never—do anything like that. It would be bad business and goes against my personal morals. Now, the legal system has shown what these allegations really were: baseless fabrications with no basis in reality. Why should Park West clients have confidence in its appraisals? Park West’s appraisals are provided by an independent and accredited appraiser who thoroughly researches each piece of art before determining the value. We regularly work with appraisers such as Caroline Ashleigh, a graduate of New York University in appraisal studies and a senior certified member of the Appraisers Association of America. We invest in these independent appraisals because they provide our auctioneers and sales teams with the confidence they need when speaking with our clients. If any of our auctioneers ever misrepresented the value of an artwork, we would fire them immediately. No other art company spends as much time and energy on educating their associates than we do; we bring each and every one of our auctioneers to annual training programs at our Miami and Detroit offices. How does Park West ensure that its clients are satisfied with their purchases? If a client is truly unhappy for any reason, we have a very clear return policy. Clients can return any item for a refund or exchange within 40 days of their purchase. We put this policy in place to ensure that every single person who interacts with Park West is completely satisfied and has an incredible experience. How does Park West verify the authenticity of its art? We stand behind every work of art that we auction with a certificate of authenticity. 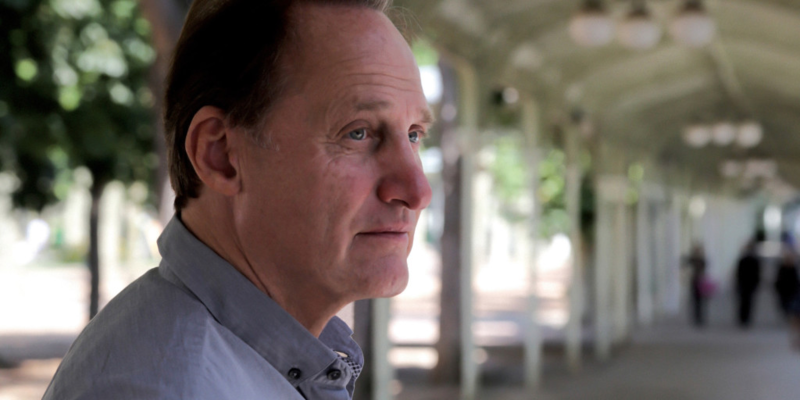 In nearly 50 years of bringing art to our clients, we have never issued a refund based on authenticity. We work directly with our artists or their estates to ensure the quality and authenticity of our pieces. When that is not an option, we work with independent, qualified experts to attribute a painting to an artist before we bring it to our clients. Our certificates of authenticity allow our clients to collect with confidence. 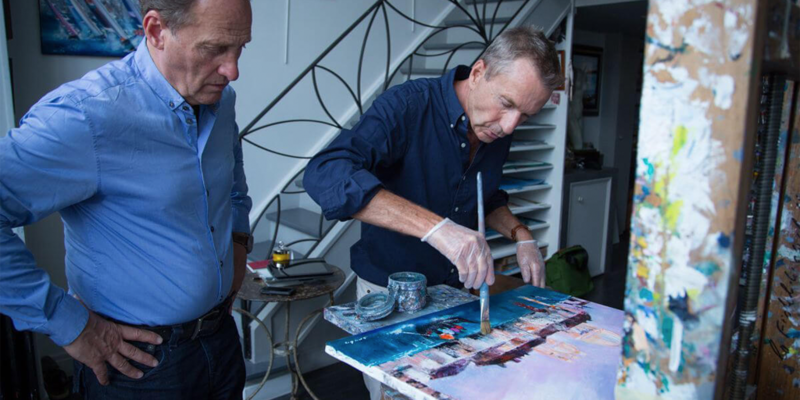 Albert Scaglione watches artist Victor Spahn as he works on a new painting in his Paris studio. Spahn is just one of the many contemporary artists that Park West Gallery works directly with to ensure the authenticity of the artwork that it brings to clients. How has this experience helped to shape Park West’s future? My ultimate hope is that every client has an extraordinary experience and walks away with a piece of art that they will treasure forever. We continue to bring art to more people beyond the nearly 2 million we already have relationships with and look forward to introducing art to many more people. I know we can never make everyone happy, but that doesn’t mean we will stop trying. We’re investing in real-time technology to enrich the experience even further to meet and exceed our client’s expectations. We’re building relationships with emerging artists to bring an even greater selection to our clients. We’ve been bringing amazing experiences to our clients for nearly 50 years, and, God willing, we will continue to do so for many more.